used the sigma 150-600mm C as a macro since I didn't bring my macro... worked out surprisingly well! Quite impressive. Were extension tubes used? useful as bugs tend to be skittish. If my reasoning is correct, then the magnification would be the same on a crop sensor as on FF. You just see less with the former. But the subject would remain the same size on the sensor. Dragonflies and damselflies come out very well with all of these sharp lenses at a distance. Here are various combinations of a Sigma 150-600mm, 400mm DO II + TCs and 100-400mm II with a 7DII, 5DSR and 5DIV. I think that they are better than macro because you can get good depth of field for these quite large insects. Oh, and I had to persuade a kingfisher hold a dragonfly about 5m away. 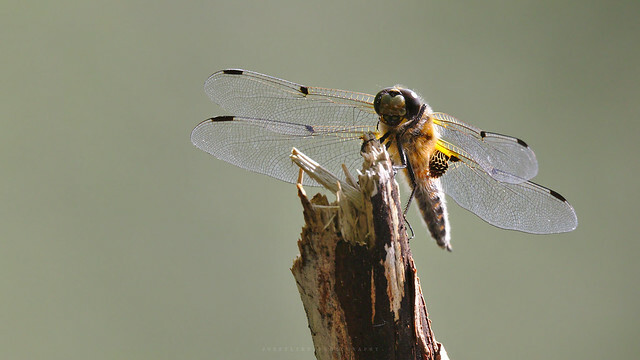 yea the sigma 150-600 does quite a good job with dragonflies! I've used extension tubes on a 300/2.8 and works very well. Still have to compare it to a 180M with 1.4x (240 mm) re IQ. Many times it has the advantage over the 105mm macro because the creatures are so shy. On other cases if you shoot a flower on the tree with macro lens you have to hike with good leader on your back - anybody tried this? I didn't ! Or simply the object is so far and there is no way to get closer because of the brush around. Most of these photos were posted already on different topics of this forum. I have many others that don't fit the recent restrictions in the Forum (and on this topic the restrictions are even more strickt) and I'm so lazy to work on them. In my own terminology I call all this "close ups". I like long focal lengths for macro's, but 15 ft in the case of the Canon 600mm L is further than I'd want. If it focused to 1 or 2 meters, it would be nice. I was under the belief that macro lenses should have floating front elements to get the best results, so its nice to see great images. I have not used my 100-400l much this year, but it does focus closely, I'd have to use at least a monopod to kold it stable for long enough to capture a creature that moved about, but for still items, I could do it. I looked at 400mm photos of macro like subjects, the only ones I found were with my 400D and were jpeg shots from a long time ago before I used RAW exclusively. It actually turned out good, considering it being handheld and a severe crop with few pixels left. A high mp camera would have lots more detail. Amazing collections of images. What a clarity of images! I love the macro of flowers. Nice collections.